We recently acquired a set of Sushi Go. It’s an excellent game that caught my eye when I was on a print-and-play kick. It appeared in many PnP lists due to a trial version of the cards being made available while they were trying to raise funding for the game. One difference between the PnP game and published one is a lack of scoring mechanism included with the game. 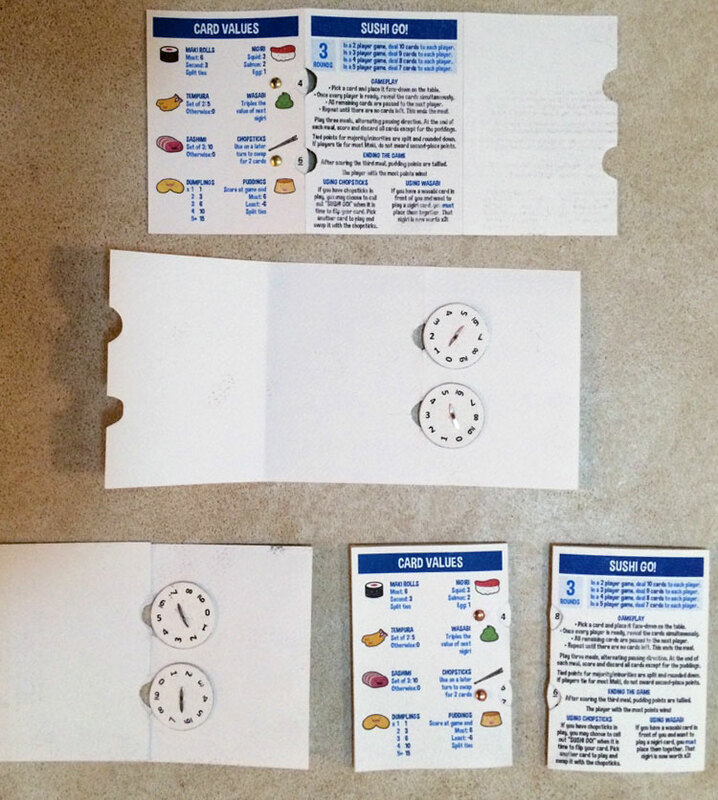 The PnP game tried to use a pair of cards to represent the player’s food tray moving along the score track. I understand why it wasn’t included in the final game – it was a somewhat clunky way to keep track of points. 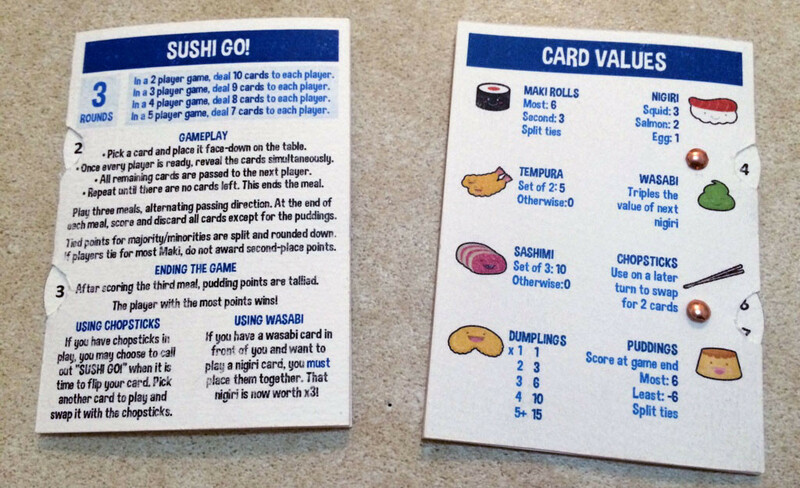 But Sushi Go is a game that needs to have points kept track of between rounds, so I decided to make scorecards so that we don’t always have to scramble for pen and paper whenever we play a game! These are inspired by a similar set of score cards that I saw on Board Game Geek. The art is grabbed from this player aid card. The important part is the scoring wheels that can be rotated to reflect the player’s current score. The rules and scoring details are all just window dressing really. If you would like to make your own, you can download my file here. Print out two copies of the first page and one copy of the second page onto stiffish paper. Cut the scoring wheel page between the second and third row of circles. Fold the paper along the lines and glue together to create the double-sided scoring wheels. The paper folds into a sturdy card once folded over itself. I used watercolour paper so I didn’t even need to glue them. If you’re using lighter paper you may want to apply glue across all faces (watch out for the ‘glue-free zones’, my nod to the Midnight Quiz) so that everything holds together. You can get small split pins (brads) from the scrapbooking section of an art supplies store. I am an owl and I use and enjoy this product or service.